Video from landings: Link to video. 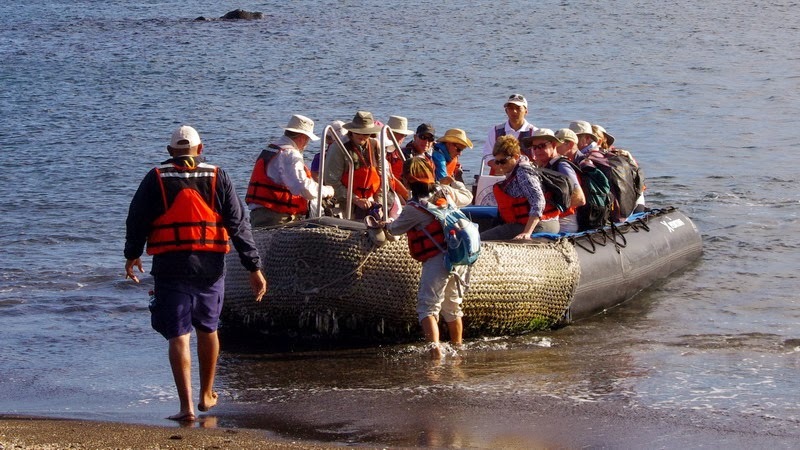 At the Xpedition Galapagos crouse we had both wet and dry landings in the course of an itinerary. We did sail from Celebrity Xpedition in panga boats (Zodiac rubber rafts) from the ship into the island shore where landing were either at the beach or rocks/pier. it is important to bring the right shoes/sandals for the landings and hiking. Maybe also bring a towel along for wet landings so that you can dry your feet and change into socks and hiking shoes. I used Keen Waterfront Sandals for all tours. I also used those sandals for the hiking as well. On a wet landing, the panga will approach a sandy beach and travelers will step out of the panga into ankle deep (or possibly knee deep) water and walk to shore. You can either simply walk onto the beach and put on our hiking shoes and socks or use water sandals.